Hubby and I started a monthly tradition last month that we are calling "Mystery Dinner". Around the first weekend of each month, one of us is responsible for choosing a menu. That person is the "executive chef" and the other is "sous chef". It's a way for us to explore new dishes we've never made while working together in the kitchen (something that doesn't happen very often). It's fun, it's relaxing and there's a payoff where we get to enjoy a delicious meal along with good company at the end of the evening. Mystery Dinner has a few rules. 1. The spouse choosing the menu has to get approval on all menu items from the other spouse before moving forward. 2. The meal must have at least 2 courses. 3. Each component should be something we've never made before or should have some level of complexity (i.e., no hamburger helper). 4. And most importantly, a bottle of wine must be consumed during the making and eating of the meal along with good music playing in the background. Hubby hosted our September dinner. He's so cute, he has this box of recipe cards that he acquired when he was just out of high school. The kind where you subscribe and they send you cards in the mail once a month. I think his aunt actually signed him up for the cards, but Hubs got into them. He started cooking for his dad and he's been toting the box around ever since. His recipe box is one of the few items that survived the merging of our stuff when we moved in together back in the day. So for Hubby's first Mystery Dinner, he broke out his trusty recipe box from the back of the cupboard and dusted it off (literally). 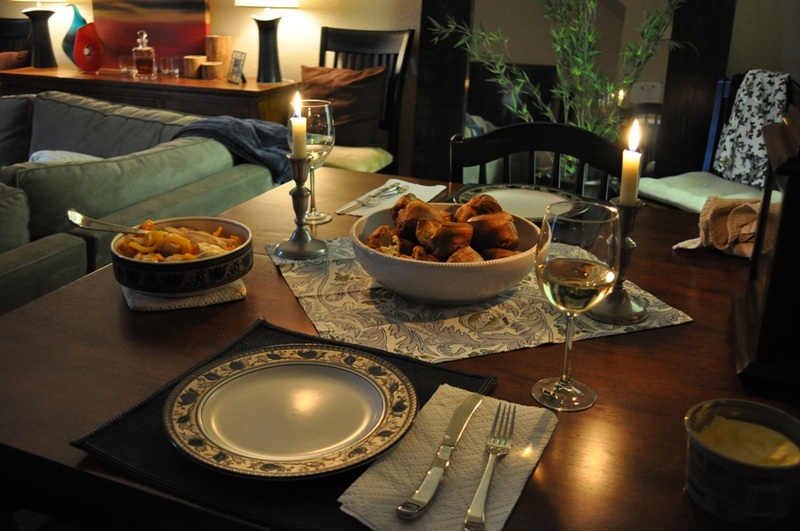 He picked out a chicken dish with sauteed orange and yellow peppers and a delicious white wine sauce, cream cheese popovers and brownies for dessert. Overall the meal was a success...but it was not without a few mishaps. We had to make the popover batter twice because the first time it was separated and kind of gross looking. And as our brownie batter was waiting to go in the oven I suddenly realized we never added any butter. Whoops! So I melted the butter and stirred it in. The brownies fared pretty well despite the almost flub. Actually, the flubs made it fun. We got to have a few laughs, some wine and we were in no hurry, so we just meandered through making the meal until it was done. Here's a peek at our first Mystery Dinner. 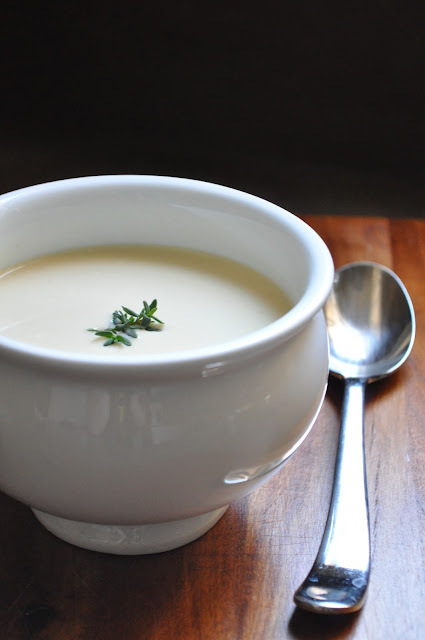 This month was my turn to plan the menu and we made 44-clove garlic soup with Parmesan cheese, fillet of beef tenderloin with horseradish cream, homemade dinner rolls (that didn't get baked until the next day) and creme brulee for dessert. With the exception of the dinner rolls, the meal was a big hit! No joke, this soup indeed has 44 cloves of garlic (which is about 3 heads of garlic). Two-thirds of the garlic gets roasted until soft and sweet and the remaining garlic gets simmered in the soup. Once it all comes together, it gets pureed into a smooth silky deliciousness. We used an immersion blender to do the pureeing--a pretty cool kitchen tool, by the way. Even though this soup has an insane amount of garlic, it has a mild, almost sweet garlic flavor. I absolutely loved it. And so did Hubby. The only thing I would add is a nice crisp Parmesan herb crusted crostada to float on top to slowly drink in all that amazing garlic heaven. Good stuff! Preheat oven to 350 degrees F. Place the 26 cloves of garlic in small baking dish. Toss the garlic with 2 tablespoons olive oil and season with salt and pepper. Cover the baking dish tightly with foil and bake for about 45 or until garlic is soft and golden brown. Remove from oven and allow to cool enough to handle the garlic. Squeeze each garlic clove to release the garlic and place in a small bowl. Heat a heavy bottom large saucepan over medium-high heat and melt 2 tablespoons butter. Saute the onions and thyme and cook until the onions are soft and translucent, about 6 minutes. Add the roasted garlic, 18 cloves of raw garlic and cook for an additional 3 minutes. Add chicken stock and cover and simmer for about 20 minutes or until the garlic is tender. 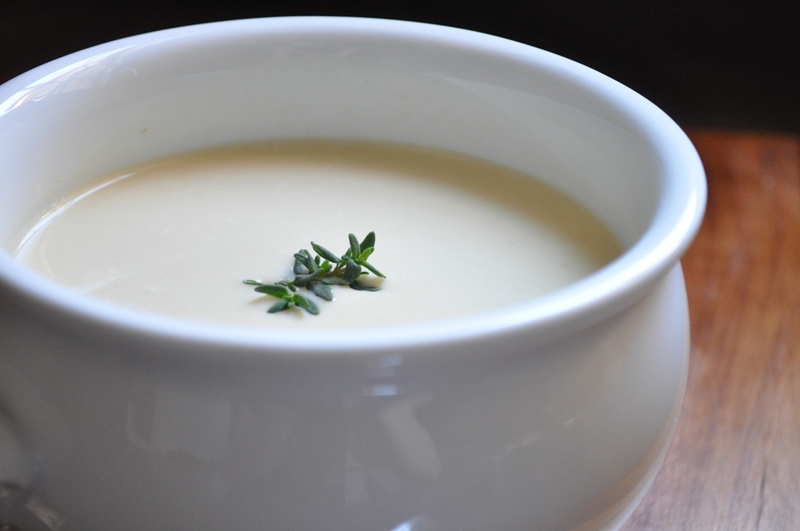 Use an immersion blener to puree the soup until smooth or transfer in batches to a blender. Return the soup to the saucepan and add the heavy cream and bring to a simmer. Season with additional salt and pepper if needed. Divide the grated Parmesan cheese equally into 4 bowls and ladle in soup. Squeeze lemon juice into each bowl and serve. Garnish with fresh thyme or chopped chives. Great idea and awesome pics, I would love to try that soup, I cant imagine it being mild with all that garlic but I love garlic so I'd be fine with that!! I love the idea for your Mystery Dinner. What a great way to spend time together and get some delicious food as a result :) This soup sounds phenomenal! Roasted garlic is good in just about anything, so I have no doubt it's a star here. You two are so cute! will you be my husband? his idea of dinner for two is BBQ and beer with heavy metal music playing in the background! I want your recipe for fillet of beef tenderloin with horseradish cream! Yum! So beautiful. I am coming for dinner. That looks so homey and yummy. What did the cats get? Will be sending all this to Andy although I am sure we won't get as elaborate as your beautiful set-up there. I like it though. You rock BF. P.S. Saw the chocolates post...Yum. they look perfect and I am so jealous I didn't get to eat them. I will be posting the tenderloin recipe tomorrow. It was delicious! I LOVE garlic and cannot wait to make this. It looks and sounds amazing! Hey, I liked this post a lot. I am also in need of some party recipes for my daughter’s first birthday bash. Recently got various ideas and recipes for frozen themed bash at Nom App. There were frozen cookies, cake and cracker ideas too. I will surely try those.